This dataset contains raw data in ASCII text format from the Harvard, JPL, and NOAA Picarro instruments. Atmospheric carbon dioxide (CO2), methane (CH4), carbon monoxide (CO), ozone (O3), and water vapor (H2O) concentrations were measured during airborne campaigns over the Alaskan and Canadian arctic for the Carbon in Arctic Reservoirs Vulnerability Experiment (CARVE). Aircraft latitude, longitude, and altitude are also provided. Flight campaigns took place from 2012 to 2015 between the months of March and November to enable investigation of both seasonal and inter-annual variability in atmospheric gas content. There are 603 ASCII-encoded text files with this dataset: 301 files from the Harvard-owned Picarro instrument (*.pkroH), 243 files from the JPL-owned instrument (*.pkroJ) and 59 files from the NOAA-owned instrument (*.pkroN). Figure 1. 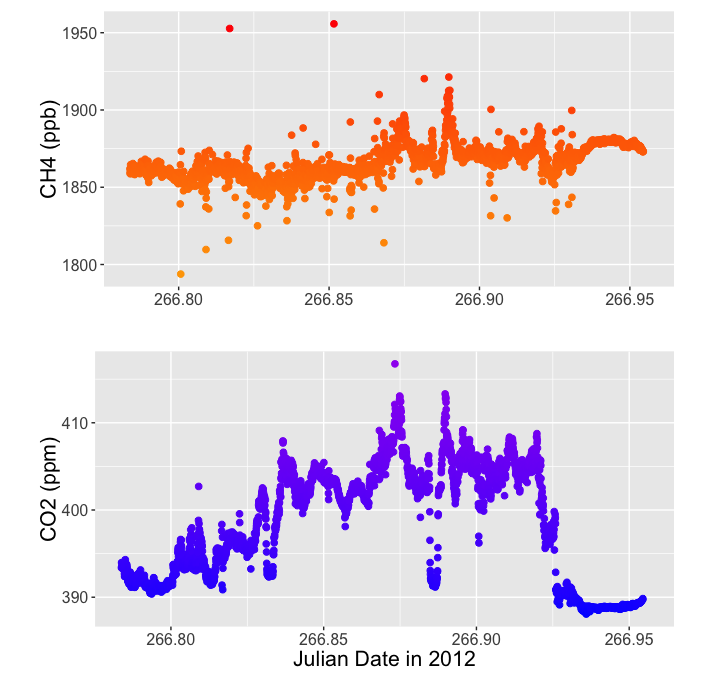 Airborne methane and CO2 concentrations during a CARVE flight over the Yukon Flats area, Alaska on 23 September, 2012. The Carbon in Arctic Reservoirs Vulnerability Experiment (CARVE) is a NASA Earth Ventures (EV-1) investigation designed to quantify correlations between atmospheric and surface state variables for Alaskan terrestrial ecosystems through intensive seasonal aircraft campaigns, ground-based observations, and analysis sustained over a 5-year mission. CARVE collected detailed measurements of greenhouse gases on local to regional scales in the Alaskan Arctic and demonstrated new remote sensing and improved modeling capabilities to quantify Arctic carbon fluxes and carbon cycle-climate processes. CARVE science fills a critical gap in Earth science knowledge and satisfies high priority objectives across NASA’s Carbon Cycle and Ecosystems, Atmospheric Composition, and Climate Variability & Change focus areas as well as the Air Quality and Ecosystems elements of the Applied Sciences program. CARVE data also complements and enhances the science return from current NASA and non-NASA sensors. This L0 data was used to generate the L2 (quality-checked and standardized) data products listed below. We recommend you use the L2 data for scientific inquiries. Temporal Coverage: Periodic flights occurred during the growing seasons (approx. March – November) of 2012 through 2015. Temporal Resolution: All measurements are presented at the native temporal resolution of the instrument. File naming convention: Files are named by the flight beginning date and time. Example file names: 20120527171324.pkroH is data recorded by the Harvard Picarro instrument from the flight beginning on May 27, 2012 at 17:13:24 UTC time. and 20120527171324.pkroN is the data from the NOAA Picarro instrument from the same flight. Each file contains several header rows beginning with the ~ symbol. Missing data are represented by -999. All dates and times are recorded in UTC time. See documentation for other CARVE Picarro data for details.